a mononuclear, phagocytic leukocyte, 13 μm to 25 μm in diameter, having an ovoid or kidney-shaped nucleus and azurophilic cytoplasmic granules. Monocytes are derived from promonocytes in the bone marrow and circulate in the blood for about 24 hours before migrating to the tissues, such as the lung and liver, where they develop into macrophages. adj., adj monocyt´ic. A relatively large mononuclear leukocyte (16-22 mcm in diameter) that normally constitutes 3-7% of the leukocytes of the circulating blood and is normally found in lymph nodes, spleen, bone marrow, and loose connective tissue. When treated with the usual dyes, monocytes manifest an abundant pale blue or blue-gray cytoplasm that contains numerous fine, dustlike, red-blue granules; vacuoles are frequently present; the nucleus is usually indented, or slightly folded, and has a stringy chromatin structure that seems more condensed where the delicate strands are in contact. Monocytes that leave the bloodstream and enter the connective tissue spaces are called macrophages. See also: monocytoid cell, endothelial leukocyte. A large, circulating, phagocytic white blood cell, having a single well-defined nucleus and very fine granulation in the cytoplasm. Monocytes constitute from 3 to 8 percent of the white blood cells in humans. mon′o·cyt′ic (-sĭt′ĭk), mon′o·cy′toid′ (-sī′toid′) adj. a granular peripheral blood mononuclear leukocyte, 13-25 μm in diameter with a lobulated nucleus, containing chromatin material with a lacy pattern and abundant gray-blue cytoplasm filled with fine, bluish granules. See also monocytosis. monocytic, adj. Hematology A phagocytic WBC that arises in BM from a common progenitor, CFU-GM; 'daughter' monocytes circulate in the blood, forming resident and transient populations in various sites; resident monocytes–histiocytes include Kupffer cells–liver, Langerhans cells–dermis, microglial cells–brain, pleural, peritoneal, alveolar macrophages and osteoclasts; monocytes normally constitute 2%–8% of peripheral WMCs, measure 12-25 µm, have a reniform nucleus with lacy chromatin, an N:C ratio of 4:1 to 2:1, and gray blue cytoplasm containing lysosomal enzymes–eg, acid phos, arginase, cathepsins, collagenases, deoxyribonuclease, lipases, glycosidases, plasminogen activator and others, and surface receptors–eg, FcIgG and C3R; monocytes are less efficient in phagocytosis than PMNs, but have a critical role in antigen processing. See CFU-GM, White blood cell. A relatively large mononuclear leukocyte (16-22 mcm in diameter); monocytes normally constitute 3-7% of the leukocytes of the circulating blood; normally found in lymph nodes, spleen, bone marrow, and loose connective tissue. 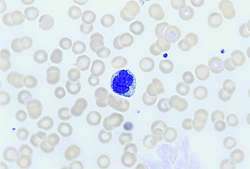 In stained smears, monocytes have abundant pale blue or blue-gray cytoplasm that contains numerous fine red-blue granules and vacuoles; the nucleus is usually indented, or slightly folded. A large white blood cell with a round or kidney-shaped nucleus. There are no granules in the CYTOPLASM. The monocyte migrates to the tissues where it becomes a MACROPHAGE. a type of LEUCOCYTE (white blood cell) of the AGRANULOCYTE group that is produced from stem cells in the bone marrow and is 12–15 μm in diameter. Monocytes remain in the blood for a short time and then migrate to other tissues as MACROPHAGES, moving particularly to those areas invaded by bacteria and other foreign materials where they ingest large particles by PHAGOCYTOSIS. See also HISTOCYTE, LYMPHOCYTE. White blood cell that increases during a variety of conditions including severe infections. It removes debris and microorganisms by phagocytosis. 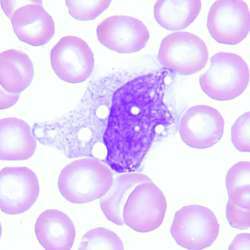 A relatively large mononuclear leukocyte that normally constitutes 3-7% of the leukocytes in circulating blood. antibody-mediated cellular cytotoxicity. They can increase in amount with certain disease. See also monocytosis. a mononuclear, phagocytic leukocyte, 13 to 25 μm in diameter, having an ovoid or kidney-shaped nucleus and azurophilic cytoplasmic granules. Monocytes are derived from promonocytes in the bone marrow. They circulate in the blood for about 24 hours before migrating to the tissues, as in the lung and liver, where they develop into macrophages. Since we found a highly significant difference of monocyte counts between patients and controls, we analysed these differences between spontaneous and non-spontaneous thrombosis and with single and multiple thrombotic events. L-4F reduced the monocyte chemotactic activity in a dose-dependent manner [Table 1]. BCECF-AM-labeled U937 monocytes were then used for monocyte adhesion and migration assays. Serum concentrations and peripheral secretion of the beta chemokines monocyte chemoattractant protein 1 and macrophage inflammatory protein 1 alpha in alcoholic liver disease. In OVA-challenged mice, the enlargement of monocyte pool was confirmed even in the bone marrow. As shown in table 4, absolute monocyte (MON) counts showed highly significant (p<0. Cytokine production was then evaluated in the PBMCs inoculated with DENV-2 or mock supernatant for 12 or 24 hours using flow cytometry The CD14+ monocytes were the only cell subset that produced TNF-[alpha] and IL-6; for example, at 24 h p.
This is the first report which describes the expression of intracellular receptors TLR7, TLR8, TLR9 and the activation of its signaling pathway in the peripheral blood monocyte population of patients infected with HIV by means of flow cytometry and may be considered a pilot study. 1) entitled "Endothelial progenitor cells (CD34+KDR+) and monocytes may provide the development of good coronary collaterals despite the vascular risk factors and extensive atherosclerosis. Lymphocyte and monocyte subset frequencies from six individual PBMC samples. The most striking finding in the present study is the reduced glutathione-induced down-regulation in binding of anti-TB antibodies and anti-DNA antibodies with antigens present in protein lysates prepared from monocyte of M.